Scotty Richardson was the first full – time employee of the Saskatchewan Curling Association (SCA). He was Secretary-Treasurer from 1946 – 1966. During his twenty years memberships quadrupled to over 20,000 registered members. He was one of the most highly regarded curling legislators in Canada. The Scotty Richardson Memorial Award, established in 1969, is presented each year to an individual in the province in recognition of their outstanding contribution to curling. Ivie (Scotty) Richardson helped guide the Saskatchewan Curling Association through 20 burgeoning years in which the membership quadrupled to more than 20,000 registered curlers. As Secretary-Treasurer, he guided and guarded the association into its most healthy financial state in history. 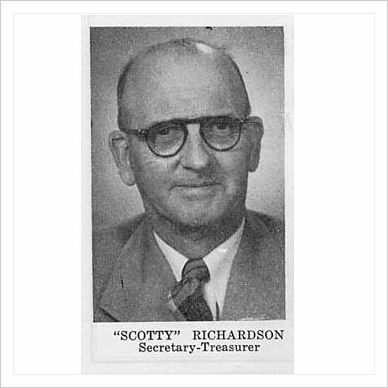 Scotty became Secretary-Treasurer of the Saskatchewan Curling Association in 1946 and set up its first full-time office in Regina. He was one of the most highly regarded curling legislators in Canada and was made an Honourary Life Member of the Association and the Dominion Curling Association when he retired in 1966 at age 73. Despite failing health, Scotty continued to show great interest in the game he helped foster up to his death in September of 1968. He assisted the Association in whatever way he could, attended many Provincial playdowns and bonspiels and only missed one of 22 Brier finals. In 1969, in recognition of “Scotty’s” outstanding contribution to curling in Saskatchewan, the Saskatchewan Curling Association established the Scotty Richardson Memorial Award. Each year thereafter, individuals have been recognized for their outstanding contribution to the sport of curling. The following is an excerpt from the SCA Yearbook of 1955/56 written by “Scotty”. This was his way of thanking all those who assisted with the preparation of the annual Association yearbook.